Designing a beautiful spring flower arrangement can be one of the most fun floral activities there is. Whether you’re planning a spring day luncheon, a splendid spring wedding or simply wanting to create a bright arrangement for your home! The beauty of the spring season is that it gives you permission to choose bright, colourful statement flowers that exude beauty. Some of the most beloved flowers for arrangements that start blooming at the beginning of spring include blossoms, hydrangeas, dahlias, and peonies, all of which are incredibly beautiful choices for your spring flower arranging efforts. At Best Buds Floral Design, we suggest starting your arrangement by choosing a statement flower as your floral centrepiece. One or two statement flowers will ensure that your bouquet or centrepiece stands out and then allows you to enhance the central flower with a range of other complimentary blooms. Others do prefer a mix of centre piece flowers and believe that more is merrier. It is, of course, entirely up to you and your creativity. Either way, choose the colour palette you are wanting to work with and more specifically, a central statement colour. To help you decide, we’ve put together a list of colours and have detailed the emotions they evoke. Yellow is the colour of happiness and often screams “spring” just by looking at it. When it comes to yellow flowers available in spring, you will be spoilt for beautiful choice. Daffodils are always a friendly and gorgeous option, as is the ever-popular sunflower. A more unusual yet very effective choice is the Snapdragon, which can be used for a vibrant pop of yellow in any arrangement. Shades of pink will be forever popular with floral designers worldwide. Pink is a perfect statement colour to use and oozes beauty and soft sophistication. Choose beautiful, serene pink tulips for your arrangement, or even the classic pink rose. An alternative yet popular choice is cherry blossoms, which will bring a pop of pink to your bouquet. White is a lovely choice for a spring bouquet and is often used for weddings, as it signifies innocence and classic beauty. It is the colour of awakening as well and is therefore often popular as a symbol of coming alive again after the hibernation of winter. Popular white flowers include lily of the valley and baby’s breath. A more unusual choice could be the dramatic anemone which is best used between September and November. For a mix of pink and white together, consider the soft ranunculus which is popular with many brides for its rose-like petals. Tones of purple and blue can bring a sense of charm and wonder to any spring arrangement. A popular flower with this colour is the hyacinth which offers striking, cool shades of purple and blue. Of course, there are always the ever-popular iris, forget-me-not’s and, of course, don’t forget stoic lilac and fragrant lavender. Choosing a red flower as your statement colour for your spring arrangement can never lead you astray. Red is powerful, striking, and always exquisite. Why not consider an unusual choice of native flower like the waratah in vivacious red, which could compliment a more classic red rose or pink-hued peony within a bouquet very well? 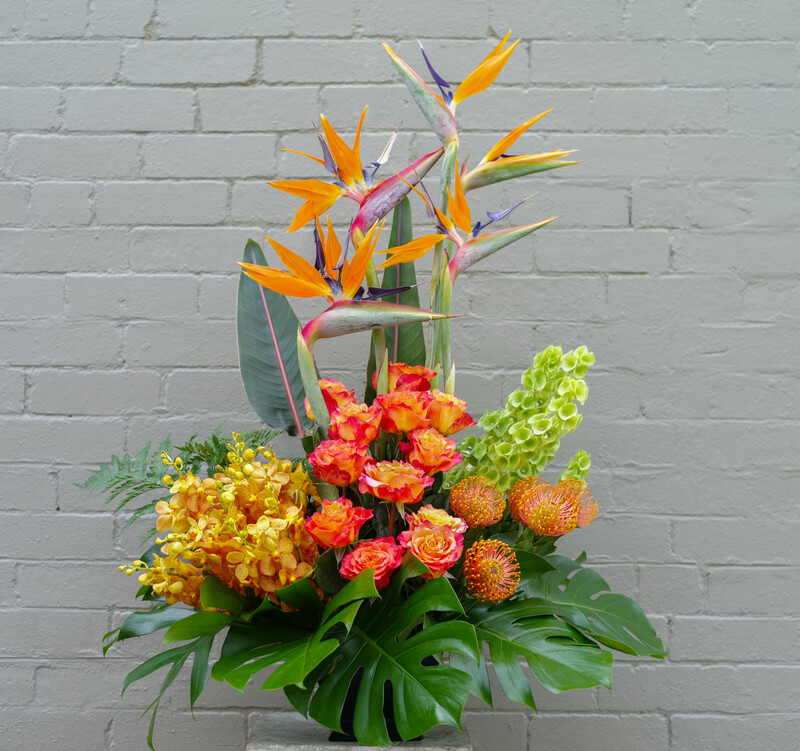 Inform yourself about native plants and flowers in your area, that might offer you some dramatic and rather unusual floral choices for your bouquet or arrangement. Start with a colour palette that will allow you to work with a statement flower and compliment it with hints of colour and choice. For more ideas and advice on spring flower arranging or to organise your own spring bouquet, contact Best Buds Floral Design today. Keep your eyes peeled on our Facebook and Instagram accounts for more.